"Can I use food (treats) with my E-collar training?" Yes, yes and yes. That is my answer to the question of using food in training. We have to remember that when we first start out teaching our dogs something, they have NO idea what it is that we are asking of them. They don't comprehend our words and can't read our minds as to what it is we want. It is our job to show them what we desire. 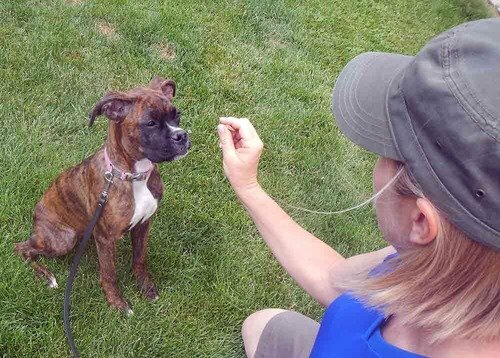 One of the easiest ways for the average person to teach a dog the meaning of a verbal cue is through lure and reward training. The idea behind Lure and Reward is very simple. The animal's body follows where the nose goes. If you think of a Hound, this picture is pretty vivid. The scent of something interesting leads that hounds body through all sorts of changes, walking along a path, then crawling under a low fence line, then stretching on hind legs to see what is up the tree. You can use your dog's sense of smell and desire for something yummy to teach the behavior of simple changes of body position, like Sit, Stand and Down fairly quickly and once the dog catches on to the cues, you can marry that understanding to the prompt from the e-collar, so you can then later build desired reliability. The key to using food in your training is learning to use it properly. Sounds familiar huh? 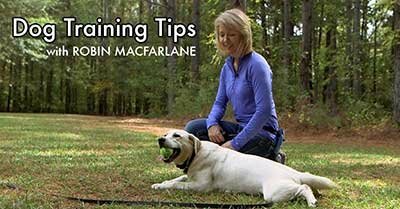 Learning to use any of our dog training tools properly is pretty much the key to success! Properly means you ONLY use it as a lure for a few repetitions. As soon as the dog catches onto the idea of following your hand, you keep the food elsewhere. A place easily accessible, like a pocket or bait bag and reward the dog AFTER they have successfully followed your hand to the desired position. Now you have developed a hand signal that can be used either as a stand-alone cue or in conjunction with your verbal commands. Eventually you can wean your dog off of any hands signals also, so that verbal commands will stand alone in getting your dog to respond. The exception to this, are dogs that are hearing impaired. For those dogs we'll continue to use hand signals and add tactile cues, so we can communicate clearly throughout their lifetime. Early in the training process begin to use the treat rewards intermittently. This is what creates a dog that responds eagerly, but doesn't become dependent on a bribe. Think of yourself as a slot machine. You pay out occasionally, sometimes a little payout, once in a while a big payout. A big payout in terms of treats means a few tidbits as opposed to one, or something more special like a nibble of chicken rather than a piece of kibble. Don't fill your dog with loads of calories just because you had one training session. I've witnessed some trainer's classes where dogs are actually vomiting by the end of a class because they are stuffed so full. That is a misuse of food rewards and a dog that is never going to work unless he's bribed to do so. Use of treats and food makes early shaping of behavior very quick and easy. I encourage it. If using treats really goes against your mindset then use a toy instead. Even better, use food, toys and play intermittently as your rewards and you never leave yourself without an option to show your dog he has performed admirably. As you progress you do not need to reward the dog for every single correct response, but I suspect we all like getting a paycheck eventually for the work we do. For your dog, that can mean continued use of an occasional treat, or a toss or tug with a toy, a belly rub and a kind word, or even permission to actually chase the squirrel! Next Article: Can I Use an E-Collar on My Small Dog? Pull-Quote= The key to using food in your training is to learn to use it properly.